Marine biotechnology deals with the probing of how the various mortal beings and activities of the sea can be utilized to give administrations and products. Marine Biotechnologists are concentrating on the multiple chemicals and proteins of marine life with expectations of taking care of numerous issues that torment the range of industries like agriculture, cosmetics, consumer products and healthcare. San Diego-based biotech company Sirenas has received its grant of USD 1.68 million from the Gates Foundation to advance Atlantis, the company’s proprietary marine drug discovery technology, which uses “big data” approaches to mine naturally occurring chemical entities for potential new therapeutics for infectious diseases. Goldstein Research analyst forecast the Marine Biotech market size is set to reach USD 5.78 billion by 2024, at a CAGR of 6.0% over the forecast years. 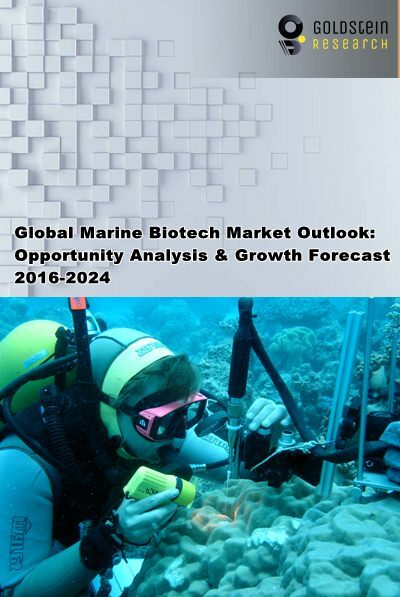 The report covers the present ground scenario and the future growth prospects of the Marine Biotech market for 2016-2024 along with the data of total number of marine biotech projects, government policies related to biosafety and access of natural resources and investments worldwide. We calculated the market size and revenue share on the basis of revenue generated from major players across the globe. Based on application, healthcare & biotechnology lead the marine biotechnology applications market at the commercial level with the market share of 24.5% in 2016 due to the several marine bioactive compounds have now been developed into new drugs to treat cancer, pain, and viral disease. For instance, compounds such as bioactive proteins from sponges may be used for antibacterial activity while skeletal elements such as biosilica serve as blueprints for new biomaterials applicable to biomedicine. Environment & consumer product are growing with the fastest CAGR of 6.1% and tends to dominate the market in the forecast period owing to the need to restore the biosphere and incorporates enormous social and economic benefits, thus providing a foundation for problems related to food as exemplified by ocean farming. Marine Biotech Market Outlook 2016-2024, has been prepared based on an in-depth market analysis from industry experts. The report covers the competitive landscape and current position of major players in the global Marine Biotech Market. The report also includes porter’s five force model, SWOT analysis, company profiling, business strategies of market players and their business models. Global Marine Biotech market report also recognizes value chain analysis to understand the cost differentiation to provide competitive advantage to the existing and new entry players. Our global Marine Biotech Market report comprises of the following companies as the key players: Aker BioMarine, CP Kelco US Inc, Elan Corp, FMC Corp., GlycoMar Ltd., Lonza Group Ltd., MariCal, Marinova, New England Biolabs Inc., PML Applications Ltd., Sea Run Holdings Inc., and Tequesta Marine Biosciences. According to the report, major driving factor is that interface between marine biotech and industrial biotech is producing new and very exciting opportunities for novel manufacturing and industrial applications, as well as ways to protect the food supply and to enforce our marine environmental laws. In addition, marine biotech has got the great potential for utilizing the biochemical capabilities of marine organisms to provide models for new classes of pharmaceuticals, polymers, enzymes, other chemical products, and industrial processes, as well as for development of vaccines, diagnostic and analytical reagents. Further, the report states the major challenge is related to access issues to marine genetic resources/organisms, biosafety issues and issues of intellectual property rights which are managed according to the Convention on Biological Diversity (CBD) and the 1982 Law of the Sea Convention (LOS Convention) which are important treaties in the emerging international marine biotechnology field. Based on geography, North America dominated the global marine biotech market with the market share of 65% in 2016 owing to government support and investments in exploring the marine biotech applications for the ecological balance and healthcare. Mozambique, India, Peru, Cabo Verde, Cote d’Ivoire, Gambia, Ghana, Guinea, Guinea Bissau, Liberia, Mauritania, Senegal and Sierra Leone are the opportunistic market for the marine biotech vendors owing to their rich biodiversity including marine diverse habitat, in addition, with supporting efficient management possibility of promoting tourism, as well as creating jobs, business opportunities, and livelihood activities that focus on conservation and biodiversity to support marine biotech market. What is the revenue of Marine Biotech in 2015-16 and what would be the expected demand over the forecast period?